I quickly want to address something before I share this amazing GRILLED HULI HULI CHICKEN! I can’t even tell you how in-love I am with this recipe, but first, I need to talk about comments. I was just reading through over 100 comments I needed to approve and I was blown away at how rude some people can be. There were a few comments with people actually cussing me out over a failed recipe and telling me the way I wrote the recipe couldn’t possibly be right. I understand sometimes they don’t work out and it could be for a NUMBER of reasons. The way you measure ingredients (especially flour), the way your oven heats, if you substituted something, or if you didn’t like the taste. I’m sure there are foods you love that I wouldn’t. So please, for heaven sakes, don’t start cussing me out over it. I won’t approve them and they go right in the trash can. The recipes I post on my blog are tried and true and to my family’s liking. I would never post a recipe I don’t love and how I explain the ingredients and instructions is exactly how I make them. I appreciate every single person that visits my blog. I can’t even tell you how much I do! But I am just a Mom, doing what I love (cooking and sharing those recipes for free!) and the last thing I need are rude and unnecessary comments. By all means, PLEASE ask me questions, I’m happy to answer questions or to help you figure out what went wrong. And I honestly don’t mind if you tell me you didn’t like something. It’s when you start cussing me out and saying really rude and unnecessary things is what I won’t tolerate. I will note- this recipe makes a TON. Perfect for a big barbecue or outdoor get together. If you’re not feeding that many you can easily divide the recipe in half. Also, I did use chicken thighs and it was wonderful, but they are fattier than chicken breasts. (That’s why they taste so dang good!) By all means, if you’re not a big lover of chicken thighs you can totally use boneless, skinless breasts. That’s what I am going to try next time! In a medium bowl, whisk together juice, brown sugar, ketchup, soy sauce, broth, ginger and garlic until combined. Reserve 1-1/3 cups marinade for basting. Cover and refrigerate. Divide remaining marinade between two large resealable plastic bags. Add 12 chicken thighs to each; seal bags and turn to coat. Refrigerate for 6 hours or overnight. Serve chicken with fresh slices of pineapple (grilled is amazing) and sliced green onion, if desired. That is awful people feel the need to cuss and to be rude. It is easy for some people to be nasty behind their computer screens without any repercussions. I doubt any of them would have the balls to say it to your face. Cowards! Anywho this recipe looks delicious! We are supposed to get snow in Michigan tomorrow, but maybe we can get out grill out soon haha. Holly, please don’t take it personal in any way. There can be a story about a couple that just found out they are expecting after trying for 5 years which is a very happy event, however, you would not believe what some people would say to this couple. I just don’t understand it. Anywho…. :) I want to tell you I love your blog, recipes (I have one in the crock pot now), your meal planner. Please continue on. You have a lot of fans!! I love all your recipes! Everyone I’ve tried turned out great 🙂 I will be adding this one. Yummy! Thanks, Kim! You will love this one! I just found your blog several weeks ago and it has changed my family’s life!! Take that, you rude commenters!! Honestly, my kids are just eating more and better every day because of these beautifully presented recipes. I am SOOOO excited to finally be able to make the yummy food that I used to just see at other people’s houses! Anyway, thank you so much for doing this. I am super impressed with the time and energy you put into it. Anyone who feels the need to be rude, well, that’s just sad. There is absolutely no point in it. Anyway, I wasn’t even going to comment because I try not to be too wordy on the internet (oh well! haha!) but I really want to counter anything negative with some positive words! Thank you again! p.s. The shamrock shakes were a HUGE hit!! Have not made this grilled chicken yet but when I do I will come back! Holly yummy huli huli Chicken. I grew up in Hawaii and we always had this for special occasions hang in there. I love huli huli chicken. I will try your recipe the next time I make it. My recipe calls for 1/2 cup frozen pineapple juice concentrate instead of 1/3 cup chicken broth and only 1/2 cup of brown sugar. The rest of the ingredients are the same. Where I live now, I have a hard time finding frozen pineapple juice concentrate. Your recipe sounds like the answer to my problem. Thank you ! I don’t understand why so many people are mean and rude these days. Try not to let it get to you. What you are doing for the rest of us is greatly appreciated. Thanks Holly, this is perfect. I have no problem finding regular pineapple juice in a can. Your suggestion to serve the chicken with grilled fresh pineapple is spot on. For adults, I marinade my fresh pineapple slices for one hour in 2 c water, 1/2 cup rum, 1/4 cup dark brown sugar. If children are present, I omit the rum, increase the dark brown sugar to 1/2 cup, and add 1 Tbsp cinnamon. It is good either way. I think I might add MORE rum for the kids. Then you can stand the against a tree and have a great time! I’m honestly joking, I have grandkids that are the loves of my life. 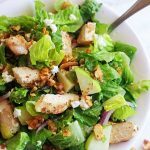 Great Blog and recipes Holly! Thank you! Very upsetting that people feel the need to be so rude! All that I have to say is that I absolutely LOVE everything that you put up on your blog! I have been coming to your blog every week now for quite some time. Seriously 90% of my family’s meals comes from your blog. And we have loved every single recipe that I have made!! P.S. This chicken looks amazing!! We will be trying it soon! I absolutely love your blog – the great recipes, the beautiful photos – you are truly amazing! And now I have another thing to admire: the graceful way you called out the haters! Way to put out an awesome recipe & blog post, and keep it classy! God bless you & your family! I love all your recipes! Everyone I’ve tried turned out great I will be adding this one. Yummy! Going to try with wings! Thanks for sharing!! There is absolutely no excuse for people to behave in the manner you indicated above. The fact that you take your time to share such wonderful recipes is to be commendable. I have tried several and have never been disappointed. Please continue doing what you’re doing as there are so many of us that truly appreciate you. For those people that feel the need to be nasty and negatively critical and cruel, perhaps they should simply avoid your blog as I’d certainly hate to see you get discouraged and decide to discontinue it. We resenrly had family bbq and I have a bunch of uncooked chicken thighs and I think your recipe will be just what I ‘m looking for. My mesquite recipe is great but I feel the need for something different and this sounds awesome. Thanks for sharing with us!!! We only have a charcoal grill and I didn’t feel like messing with it last night, so I cooked this meal in a cast iron skillet. I used boneless, skinless chicken breasts and they were overcooked and tough, and seriously… it was still awesome! This recipe is yummy yummy yummy! Next time I will pound out the chicken. It seems to be the only way I’m capable of getting it cooked through without turning it to rubber. You are my all-time favorite food blogger! I’ve always loved cooking, but had lost my inspiration until I ran across your site. It’s amazing that you can come up with a recipe so good that I can’t even ruin it with overcooked chicken. =) You rock! I also want to add to the love and say how terrible it is that people would cuss you out because they didn’t like a recipe. Those people lead a sad existence and I hope you don’t let them get you down. I can’t imagine how tough it must be to read such things. Hang in there, girl. Your recipes are amazing. Thank you for this recipe. I had the conversation yesterday with my husband that I wish I could find the BBQ recipe for the chicken I had at TED’S on the North Shore and here it is. I’m super excited to give it a go. Thanks again and I’m sharing the recipe and the blog with family and friends. It looks amazing and yes I would it cuz is different!! I do tend to get in recipe rut my self so always looking for something different!! Great job on photos too!!! I can not wait to try this. Hubby and I were stationed in Hawaii when we were first married, and we had Huli Huli chicken all the time. I cheated though, and bought the sauce pre made. It is still one of my favorites 30 years later! Thanks for this recipe!! I made this tonight and it was amazing! I decrease the recipe to 1/4 since I’m just cooking for 2. I also added peppers onions and carrots. It was VERY good. Thank you! I haven’t tried this yet, bit I definitely will. As to the comments issue. My Mama told me if you don’t have anything nice to say. KEEP YOUR MOUTH SHUT. Just my opinion. Feeling for ya. Made this recipe about a month ago. Hubby and I love it. I did cut the recipe in half. Getting ready to make it again. Very flavorful. I like to use chicken thighs. Thanks for the great recipe. This recipe is a big hit with all my friends and family. Last time I made this, I made a batch for around 15 pounds of boneless skinless chicken thighs. At my house we like it when I add a whole seedless diced Jalepeno for one recipe. Just gives it a nice flavor. Can’t wait to try this recipe! I am Hawaiian and love huli huli chicken. 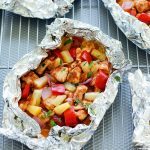 This recipe varies from what is considered traditional huli huli chicken, but that doesn’t mean it isn’t yummy or worth trying. And just a lil fun fact: huli huli means turn turn. Traditionally this chicken is cooked on spinning spits, but it can be grilled, too! Thanks for this recipe! Just got a new grill and can’t wait to throw this on there! This looks delicious! I will give it a try! I just tried this recipe for my family and we loved it, I think it’s going to be a favorite. I made this last night for dinner and OMGEE so good!! I didn’t have 6 hrs to marinade it so it only got about 3 hrs but it was still very good. Everyone loved it! Thanks! It makes me sad that people use social media as a weapon. I don’t know what happened to being Godly and kind to one another. If you don’t have anything nice to say don’t say anything at all. Anyway, this is the first time I’ve ever looked at your blog and I’m excited! This recipe looks delicious. Can’t wait for the weather to get a little warmer so we can try it. I’m sure it will be a big hit with my family. Looking forward to seeing more of your recipes! Can’t wait to try this , looks amazing- I’m always looking for tasty options that are low sodium! I think it would be great with a side of coconut rice. YUMMIE. My daughter doesn’t ask me to Panda Express (her fav) anymore. Instead, she asks me to make “THAAAAT” chicken. Thanks for the awesome yummy recipe. Wow…just, wow! Why, on EARTH would someone act like a rude low-life over a r-e-c-i-p-e! Yikes! My mother always told me to ‘Consider the source’! I am so glad I found this recipe! Soooo beautiful! I go in KNOWING my finished dish will look AND taste NOTHING like the picture & recipe! Hey…as long as it tastes good, I’m ok with it! No one to blame but little, ol’ me if it doesn’t turn out! My husband & I spent a month on Oahu in ’04 & the little town of Haleiwa(haw-lay-EVA)had THE best Huli-Huli Chicken! We went back several times, and, we were sad they only did this on weekends! After the first time sharing, we each got our own! Sorry…not gonna share, it’s too freakin’ yummy to share! We’re going back in 2 years with our granddaughter, who will be 12, & introduce her to this amazing treat! Believe me!…it WILL be better than ANYTHING I can make! Thanks for this recipe! Making it soon! I just added to the Weight Watchers website and gave credit to your blog. 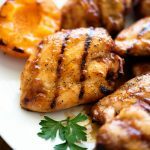 If you substitute the chicken thighs for breasts, it is only 4 point dinner and that includes ALL of the marinade on the chicken. Because you discard the most of the marinade before grilling, it is likely closer to 2 points! Nice recipe and good luck with your blog. You are never going to get away from mean people.Especially with the internet.Just know that their are many of us who appreciate you posting your recipes.Thank you. I jjust added milk mayo mix to pasta and it seems to be quite soupy. Will this eventually thicken up? Did everything according to directions. What sides are the best to go with this dish? Simply amazing chicken!!! Had a party of about 50 people and make skewers with this marinade. Rave reviews. Don’t listen to the haters!! Yesss! I was raised in Waimea, Big Island and miss the huge huli huli fundraisers at church. (Smell it for miles around!) I want to thank you for a perfect recration of my child hood favorite. I grilled and used a re-dip method i learned from my Chamoru Army buddy. Had some thickened sauce on the side to coat final batch. Added a lot pinapple juice to get carmalization and sweeter taste. Much apprechiated! Ono grindz!